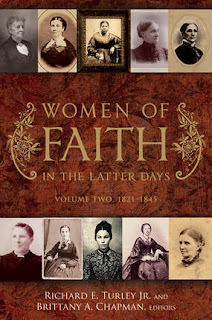 In this second installment of the series, Richard E. Turley, Jr. and Brittany A. Chapman have collected the stories of thirty women (thirty-six if you get the ebook) born between 1821 and 1845 who joined The Church of Jesus Christ of Latter-day Saints in its earliest days. As with the first volume, each of the women is profiled in her own chapter, beginning with a brief biographical sketch followed by a longer “Life Experiences” section which provides more details about specific incidents. The stories are often told in the woman’s own words from original journals, autobiographical sketches, or letters. I was glad to see that half of the author contributors were descendants of the woman about whom they wrote. Other chapters are written by notable Mormon historians including Laurel Thatcher Ulrich and Margaret Blair Young. While a few of the women included are recognizable names (such as Jane Elizabeth Manning James, one of the first African American members of the Church and friend of Joseph and Emma Smith; Emmeline Blanche Woodward Wells who served as general secretary of the Relief Society for 20 years and as president for 11; and Aurelia Read Spencer Rogers, the founder and first general president of Primary), many of the women included are relatively unknown. Their stories of hope, resilience, and faith are inspiring. I’d like to highlight just three of them here to give you a taste. Jane Cadwalader Brown was born in 1832 in Ohio and was raised in the Quaker faith. Shortly after her father’s death in 1848, she married William Derby Johnson, who was already a member of the Church, and two years later she was baptized. They traveled to the Salt Lake Valley in 1861 and after ten years there followed Brigham Young’s suggestion that they move south near Kanab. They started the town of Johnson and lived there until 1890, at which point they decided to move to the Mormon colonies in Mexico to be with their children. Jane died there in 1908. “Our reason, the greatest gift of God to man was given us for cultivation and our life here on earth presents a series of opportunities of transforming circumstances into eternal knowledge. Progress is the keystone of heavenly thought and plan, and for an individual to live and die without the world being the better for it, comes short of the object of their existence. True knowledge no matter of what science or art is given man of God, and every acquisition which advances us one step should only broaden our reason and strengthen our belief (which is simply physical knowledge) in the existence of God, and of our unbounded obligations to him." Elmina’s desire was that the YLMIA would help young women to “cultivate every gift and grace of true womanhood…To this end every effort is made to induce independent thought, study, individuality and progress.” Under her leadership, the basic structure of the Young Women’s program was developed, including weekly meetings, the curriculum, and annual conferences, and the YLMIA became a member organization of the National Council of Women. At that time, these church-wide callings were held until death, so Elmina served for 24 as president of the YLMIA. Jane, Esther and Elmina are just three of the unique and notable women in this volume. I highly recommend you find yourself a copy and become acquainted with them and our other sisters in the gospel from this time period. ** Note: I received a review copy of this book from the publisher.